San Francisco-based printmaker Juan Fuentes, whose body of work spans more than four decades, will have a solo exhibition depicting the struggle of farm workers beginning later this month. “Visual Tribute: A Dialogue with Cesar,” which opens on April 23, will coincide with the annual Cesar Chavez Parade and Festival. Much of Fuentes’ work is thematically tied to the United Farm Workers movement. He grew up in a family of farm workers who settled in the Salinas Valley, and as a young boy often worked in the fields. 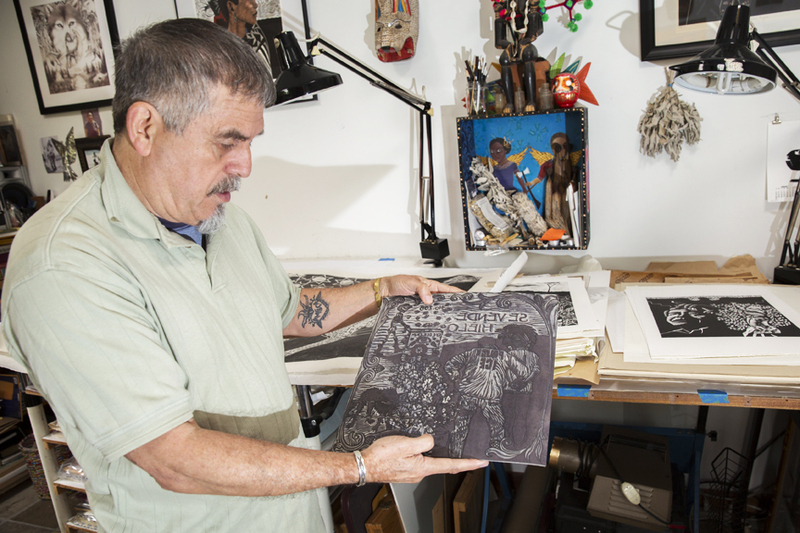 Fuentes began his career as a printmaker after graduating with a degree in painting and drawing from San Francisco State University in 1975. 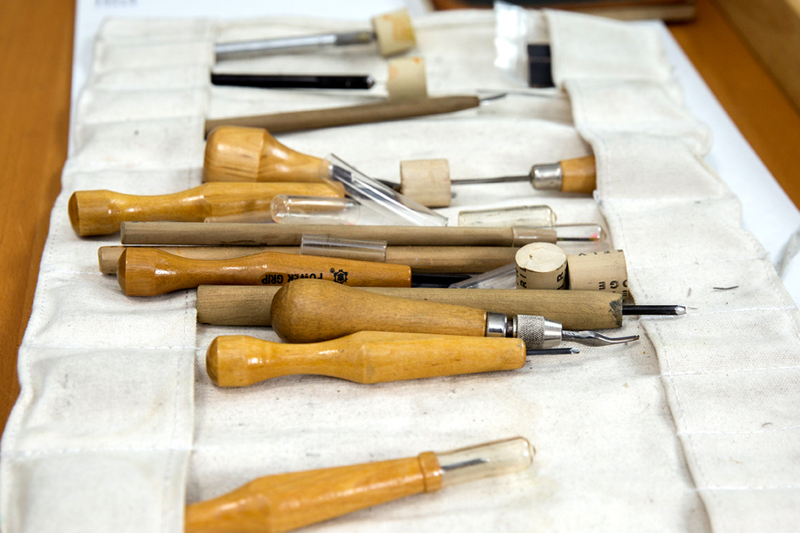 His interest in printmaking grew during his studies. 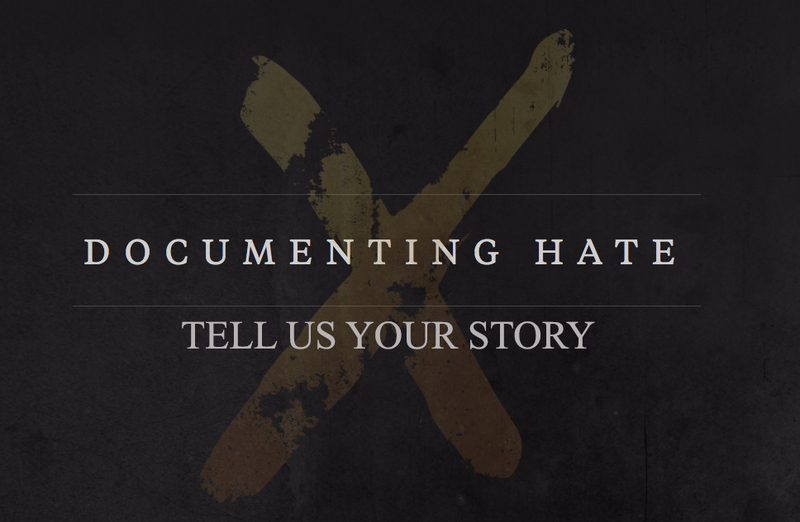 Fuentes’ subject matter, which he describes on his website as “dedicated to supporting and being part of a global movement for social change,” also took shape in the 1970s. After graduation, Fuentes began working as a printmaker at FITS printing on Valencia Street. 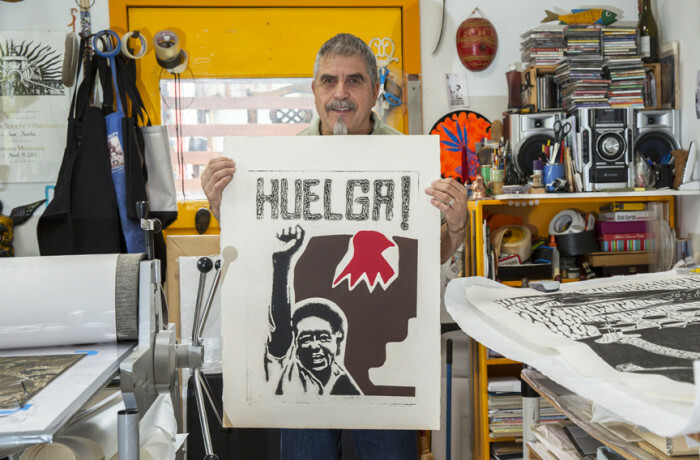 He also became involved as a volunteer for El Tecolote newspaper and did work as a poster maker for Acción Latina’s Encuentro del Canto Popular, an annual celebration that promotes Latin American music with a social justice message. Over the next few decades, Fuentes used his artistic skills to give back to the Mission community as an artist and teacher. 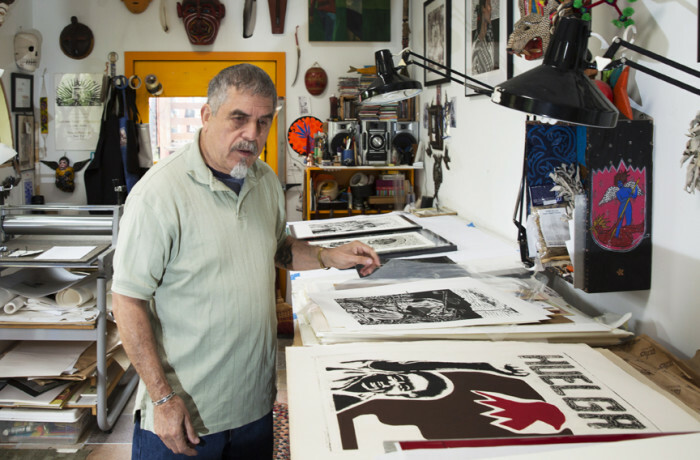 His posters and prints from this period were often in solidarity with such struggles as the Chicano movement and the fight for equality for the African American, Middle Eastern, Asian and Native American peoples. 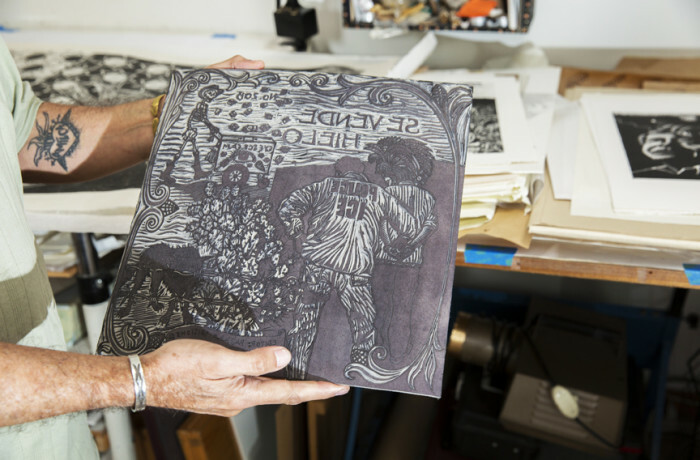 In 1997, while working as an art teacher at the San Francisco County Jail’s Arts Program, Fuentes began working in relief printing, a style of printmaking where a plate or block is carved and protruding surfaces are then inked to produce a print. 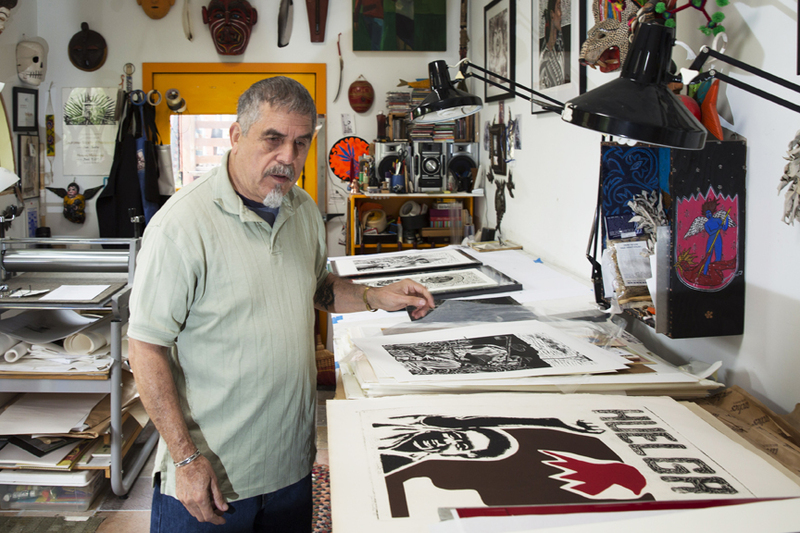 Up to that point, most of Fuentes’ work had been silkscreen prints. The prints exhibited in the show are done in both mediums. 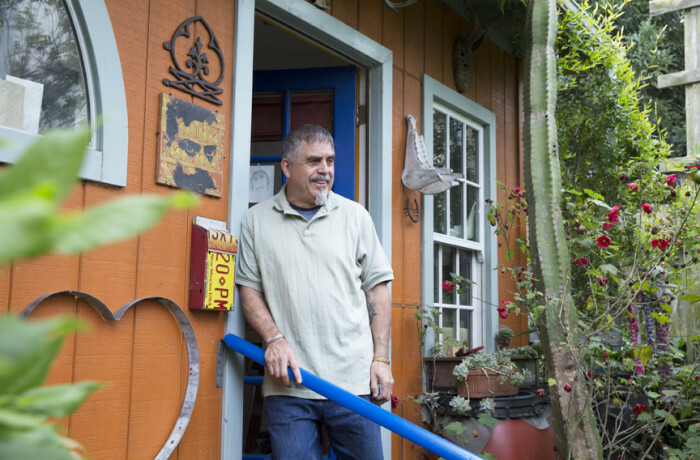 Since 2007, Fuentes has worked out of his studio, Pajaro Editions, in the Bayview district. 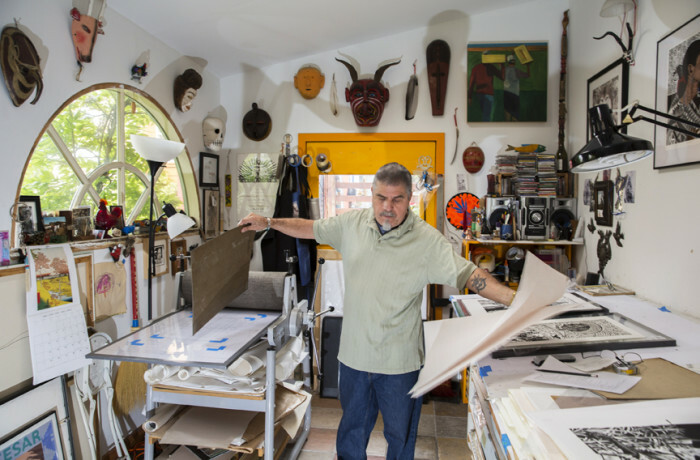 He’s also a founding member of the Bayview’s 94214 Gallery and serves as a mentor to many emerging Bay Area artists. Visual Tribute: A Dialogue with Cesar’s opening reception is April 23 at 5 p.m. The gallery is located in Acción Latina’s headquarters at 2958 24th Street and is open Tuesday – Saturday, 11 a.m. to 5 p.m.
Join the Facebook event page for more information about the opening reception.